Move over Jessica Rabbit there's a new dame in town. Carol MacNeil and Richard Stursburg tied the nuptial knot on June 27 here in Toronto, and yours truly created her makeup and hairstyling. Her dress was exquisite and reflective of that Hollywood Glam Era when brides were gracefully gorgeous and grooms were definitely dapper. The Makeup - simple, even skin tone was created with MAC Face & Body Foundation, Cinema Secrets Cream Foundation and Audrey Morris Dual Finish Powder. Brows were defined with medium brown eyeshadow and a flat angle brush. MAC Fluidline Dipdown Gel Liner was applied only on the upper lid topped off with medium and short individual false lashes. Covergirl VolumeExact Waterproof Mascara in Deep Brown was applied to the lashes, with a second coat over the fake ones as well. A hint of blush and a darker lip in a slightly pink hue was used to incorporate the colours of the flowers. No gloss was used and skin tone was kept matte to reflect the authenticity of the era. The Hair - A Lauren Bacall side sweep shoulder length style with a curlier version of a page boy and one side dressed behind her ear was the choice. Conair Jumbo Instant Heat Rollers were used to create this look giving it bounce and lift in a natural way. Very little backcombing was needed at the crown and it stayed beautifully throughout the festivities with the assistance of Dove Flexible Hold Non-aerosol Hairspray sprayed on my hand first and then stroked over her tresses. The Dress - elegant, sophisticated, thematic and simply stunning. The extra fabric coming from the bust line was ingeniously designed so it could be tied criss-crossed around the midriff to reflect a Grecian goddess or could be draped over the upper arm leaving the shoulders to show and tucked in at the back of the strap and flowed while walking which simulated the flow of train, but without one. Several looks can be achieved by directing the extended fabric in a variety of ways. The Non-traditional Aspects - the bride bumped into the groom in the elevator complete with rollers and robe - Yikes!! 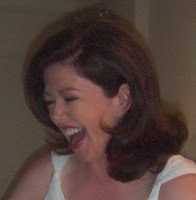 What's a gal to do but laugh and enjoy the moment - which is Carol's MO. What's the male equivalent of a Bridesmaid? Ideas welcome. Carol had both genders represented. Back to Tradition - The happy bride and groom - sill looking radiant with minimal, and I mean minimal touch up - in fact nothing in the makeup department and just a comb through on the ends of the hair. CONGRATULATIONS and best wishes for a long and happy marriage - it was my pleasure providing the beauty services for your very special day. The traditional month of Brides is June and it can be warm, hot, cool, rainy or absolutely beautiful. So how does a bride prepare for the one thing she can't control - the weather? Delegate, delegate, delegate everything you can to your bridesmaids - that's their job isn't it? eg. being prepared for any weather means having on hand - light, see through rain gear/large umbrellas and foot coverage over those expensive shoes for the rainy days, shawl for cool days, fan and absorbent tissue for humid days, etc. The more you plan, the more relaxed and carefree you'll be. My job is to zero in on the makeup and hair department - so here's some suggestions. Its always a great idea to carry a form of compact powder and absorbent tissues or face blots. Dual Finish Powder, like MAC Studio Fix, or Audrey Morris Private Label Dual Foundation Powder are handy for inclement weather and keeps you looking bridal fresh throughout your festivities and for all the those "candid" shots. One fave is MAC Face & Body Foundation with a finishing powder overtop. This process never fails me or the brides I do and especially for the more mature bride is simply lovely and fresh. What I especially love about a dual finish powder is it covers from light, applied with a fluff brush, to full coverage with a sponge using a stipple method of application. And remember too much SPF in the product may show "white face" in flash photography, but the ones I've mentioned here work great. Mineral products can be fine for dry skins but for oily they're not my first choice. Mineral powders generally tend to grease up quickly - and a fresh glow is great, but grease is groosome. And minerals need to be touched up every couple of hours. Airbrush - its great - but its just another tool. If you're going to use it either Kett or Obsessive Compulsive are my faves. But they aren't FDA approved either, so something to consider. Either traditional or airbrush can look amazing - the skill is in the artist applying it and knowing what your skin will look and wear best with. This makeup maven and her clients are also loving Maybelline Superstay lipcolour for long wear without drying or moving into the fine lines around the mouth. Just touch up with the balm end of the tube (you don't even need a mirror for this cause the lipcolour stays put and you're good to go. Now for hair - if you want the most carefree hairstyling then an updo or classic chignon won't require the grooming that hair left down will. And, if its hot or humid you'll be really glad you kept your hair off your neck. Mama's also loving the Jessica Simpson wigs for that half up/half down curly look as this synthetic fiber has a built in memory and retains its look through the day and evening. Human hair extensions can be great. But be wary of extensions touting themselves as good quality which hold the curl you put in. Often substandard hair is sold as "human hair" but, in fact, this is a false promise. Speak with a couple of stylists who work consistently with hair pieces and get the real goods on your choices. Remember - whatever the weather - its the celebration of your union that's important, so enjoy the process "Come Rain or Come Shine". 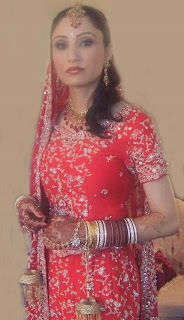 Brides in all ethnicities want to look beautiful while respecting tradition - yet keeping up with the times. Even skin tone is a must and foundation must match. Black, Indian and Mediterranean skin look best with a warm rather than ashy undertone foundation. Asians desire natural skin colour contrary to beliefs they prefer pale versions of themselves. And the Scandinavian, British and cooler countries need to neutralize the undertone in their pale to ruddy complexions. 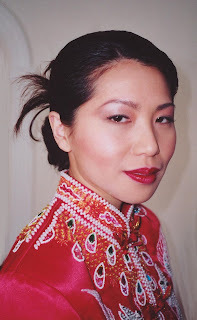 A great warm-red lipstick is perfect for the Chinese Tea Ceremony dress. Traditional Indian can be complimented with rich blue-reds. And the traditional white dress is works best with a lip colour that harmonizes the attendants’ dresses and flowers. Avoid bright lipstick on pale complexions. Eyes in any ethnicity are the focus. The darker the skin tone and intense the brows and lashes, the more attention should be placed on shaping the hair than excess product. Only black skin and hair warrants black eyeliner. And darkest brown is better than black for an elegant look. A matte finish is also more refined. Its about the bride’s charm, not her makeup - in any language. Avoid an unnatural crease with Asian eyes - it draws attention to the makeup rather than the natural beauty of their eye shape. Clear mascara is great to keep eyebrows held in place - apply up and outward and hold down for 10 seconds to lock in place. Whatever the ethnicity, unless a bride has amazingly thick lashes, false ones properly trimmed and specific to her face and eye shape, is the best way to achieve intensity for the camera and stage without looking overdone up close. 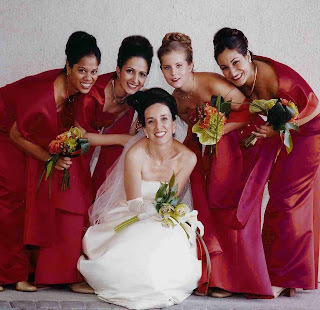 Natural, elegant looks stand the test of time and wedding pictures look great for a lifetime.